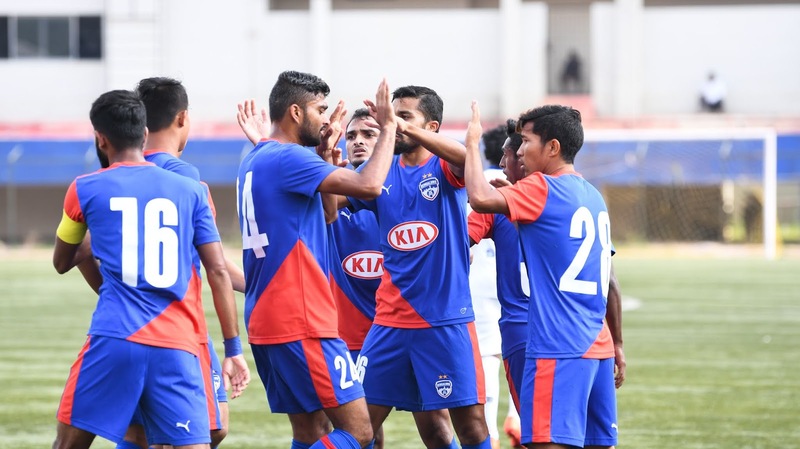 Bengaluru FC bounced back to winning ways in the BDFA Super Division League with a 9-0 thrashing of Students Union in a Round-3 encounter at the Bangalore Football Stadium, on Friday. Leon Augustine’s hat-trick (18’, 46’, 87’) and Naorem Roshan Singh’s brace (10’, 20’) powered the big win as Asheer Akhtar (22’), Calvin Baretto (71’), Myron Mendes (72’) and Edmund Lalrindika (80’) too got on to the scoresheet. Going into the game, Coach Naushad Moosa made three changes to the line-up, handing starts to defender Biswa Darjee, midfielder Ajay Chhetri and BFC U15s 'keeper Herojit Singh who made his debut. After some early chances which were thwarted by Students Union goalkeeper Calvin Abhishek, the Blue Colts broke the deadlock in the 10th minute after attacker Roshan Singh controlled and smashed home Biswa Darjee's outside-of-the-boot cross in from the left. Moosa's boys kept the tempo high and netted three more times in a span of five minutes. Leon doubled the lead when he headed in Ajay Chhetri's deft chip in from the left in the 18th minute before Roshan completed his brace two minutes later. SUFC failed to clear Ajay's cross in from the left and Roshan reacted quickest to finish to make it 3-0. Bengaluru then struck twice more in the final ten minutes. Edmund controlled Biswa's cross in from the right and scored on his second attempt after the first one was blocked, and then claimed his second assist when he set up Leon to complete the latter’s hat-trick with three minutes left to play.